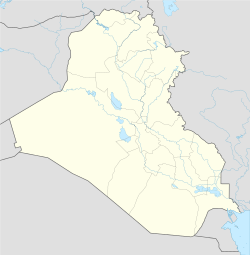 Ba'adra, also rendered Baadre,Badra and Bathra, (Arabic: باعدرة/باعذرة‎, Syriac: ܒܝܬ ܥܕܪܐ), is an historically Assyrian town located in the Shekhan District of the Ninawa Governorate in northern Iraq. Ba'adra's residents are mostly Kurds (Yezidies)with a small Assyrian minority and is considered the political capital of the Yazidis as it has been the base of the ethnic-regilous group's leader, the Mir. The town and the 10 nearby villages took in 2,028 additional displaced families totaling 12,115 people due to the Yazidi fleeing the Sinjar massacre. ↑ 1.0 1.1 1.2 Melchior, Jillian Kay (September 19, 2014). "Escape from Mount Sinjar". National Review. Retrieved October 7, 2014. ↑ Allison, Christine (2004-02-20). "Yazidis i: General". Encyclopædia Iranica. Retrieved August 20, 2010. There are probably some 200,000–300,000 Yazidis worldwide.